It is only available in black and lead time is 7-10 business days. Innovative works with leading casino operators to develop mounting solutions for technology devices in the gaming environment. Table-top kiosks and touch screens need not occupy valuable floor or gaming table space - Innovative’s floating mounting arm mounts to the underside of the table. The screen may quickly be moved to a comfortable viewing height and angle, and then stowed when not in use. Consult with Innovative for space-saving solutions to your mounting challenges. Mount a kiosk or monitor to the underside of a gaming table or counter. Perfect for providing dealers and pit bosses with an easily accessible computer which can be moved out of the way when not in use. Similar to model 3520, but with a longer reach, innovative 7020 arm enables the screen to quickly be moved to a comfortable viewing height and angle, and then stowed when not in use. Perfectly accommodates users of various sizes. No need for table-top kiosks and touchscreens to occupy valuable table space. Save space with Innovative’s 7020 under-table monitor mount. The long-reach 7020 monitor arm enables the screen to quickly be moved to a comfortable viewing height and angle, and then stows when not in use. The longer arm and ergonomic design perfectly accommodates users of various heights. 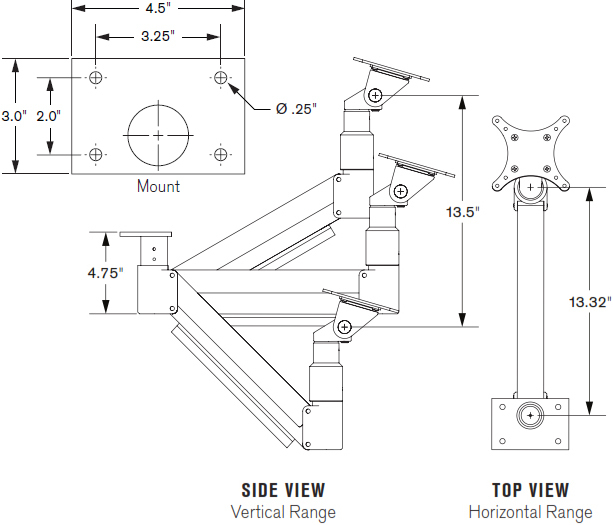 Arm mount offers vertical adjustment range of 13.5"
Arm extends up to 13.3"